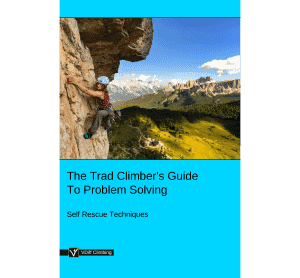 This article, Improvised Aid Climbing, is part of the e-book - The Trad Climber's Guide To Problem Solving. 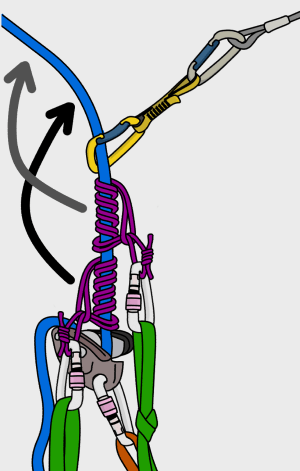 * This article is about using improvised basic aid techniques while trad climbing. To learn more about aid climbing on big walls, see our articles here. Using protection pieces as hand or foot holds is generally regarded as a poor style of ascent. But using this simple technique to get yourself out of trouble is very good style. 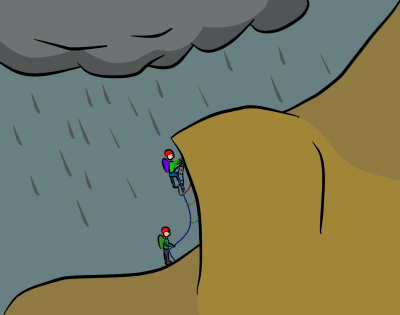 Many alpine routes have sections that, in poor weather, may be impossible without using aid. Just a few aid moves may be all that is needed to reach a summit or a safer descent. Knowledge of aid techniques can also provide a way to safely move up or down a crag in an emergency. 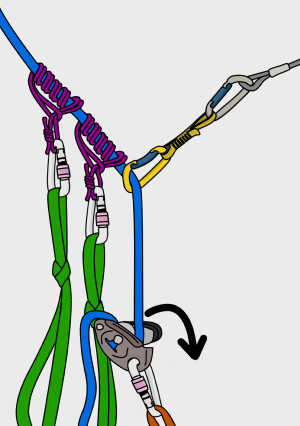 This is the most basic form of aid climbing which means grabbing hold of a piece of gear and pulling on it to miss out a move. You could also clip a sling directly to the gear to use as a foot loop. 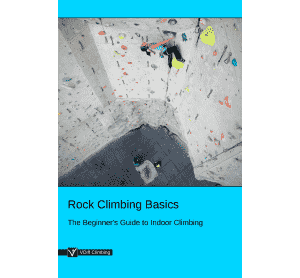 If you think your partner may struggle to follow a section of the climb, you can help them by placing gear frequently enough so they can pull from one piece to the next. 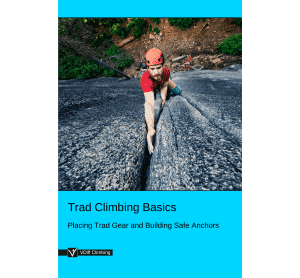 Aid climbing is more efficient when using daisy chains and etriers, but these are not worth taking on a climb unless you specifically plan on aiding sections. 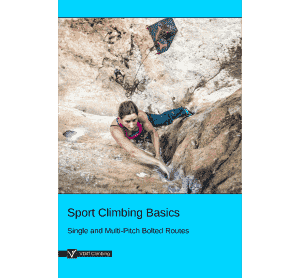 * Two double-length slings girth hitched through belay loop, with overhand knots tied at intervals. Knots are offset so the loops stay open (improvised daisy chains). * Two long slings/pieces of webbing attached to daisy chains with a carabiner. 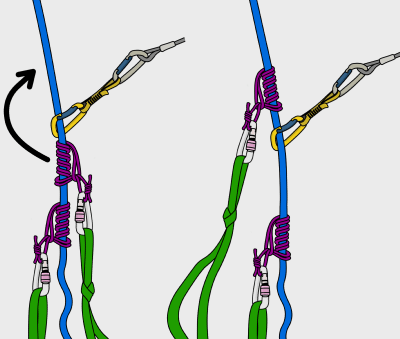 Offset overhand knots are tied at intervals (improvised etriers). It’s better if the daisy chain is on the spine side of the carabiner, and the etrier is on the gate side. This allows your daisy to slide up the spine (rather than get stuck in the gate, or unclip from it) when you stand up high. Place a piece of gear and clip an aider to it. Unless you've just clipped a bolt or an obviously bomber piece of gear, you should test it before fully committing. How you test it depends on what the gear is. First, ease your weight onto the piece, until the majority of your body weight is on it. Nuts, slings and pitons can be ‘bounce tested’. Do this by bouncing your weight on your top daisy, with a slightly increased force each time. This puts more force on the piece than just your bodyweight will, so if it survives the bounce test it's unlikely to randomly pull out when you're weighting it. If it fails, you'll swing gently onto your daisy on the lower piece, which should still hold because you bounce tested it – right? More easily damaged or low-strength gear, (such as cams or micro nuts) should only be very gently bounced. Tiny cams or skyhooks shouldn't be bounce tested, as they would be damaged over time. To test, weight them and press your body away from the wall to generate a little more force than bodyweight without the harsh impact of a bounce. Move side-to-side and outwards from the wall a little, too. This simulates the direction you might pull the piece when you're higher up on it. Once you're happy that the piece will at least hold your weight, it's time to commit. Shorten your daisy or clip in directly to the piece so you can sit in your harness. Reach back down and clip your lead rope into the lower piece. Then remove your aider from it. Getting as high on your top piece as you can means less moves to the top. On slabby terrain, use the steps of your aider to walk upwards. With practise you should be able to stand in the top step. Your daisy will slide up the spine of its carabiner. Adjust your daisy shorter to give you some downwards tension for balance. This also means that if you lose balance you won't fall the full length of the daisy. Vertical or overhanging terrain is more strenuous. 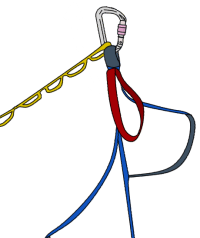 Pull on the gear while walking up the steps until you can clip directly into the gear with the carabiner on your belay loop. Once you are as high up as you can get, it's time to place a piece of gear and repeat step one. 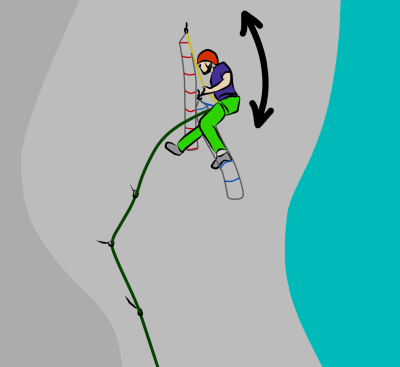 To follow a section of aid, you can either prusik up the rope or aid up using the same technique as the leader. 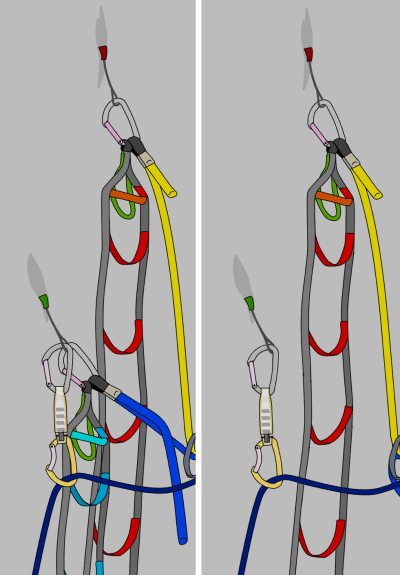 Make sure to communicate with the leader so they know whether to belay you or fix the rope to the anchor. 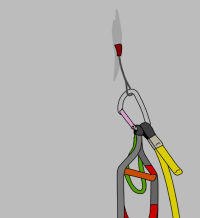 If the rope isn't pulling tight on to a piece of gear, you can simply unclip the gear from the rope and remove it. Make sure to unclip the gear when your prusik is still a few inches below it; your prusik will jam into it if you go too close. Prusik close to the piece. Pull slack through your GriGri and weight it. Remove both prusiks (one at a time) and re-attach them above the piece. 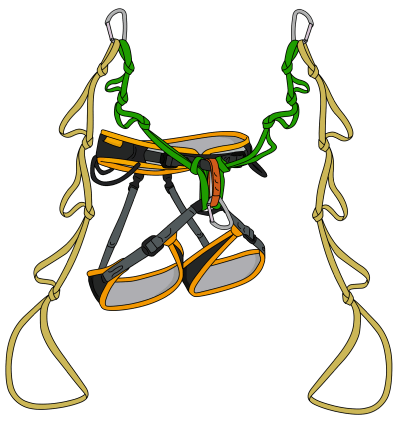 Release rope through your GriGri so that you are weighting the prusiks. Now you can remove the gear. The system for aiding a roof is basically the same as a traverse. Just place a piece, reach as far sideways as you can, and place your next piece. It's hard to transfer your weight to your new piece to test it, so try stamping in your etrier instead of weighting your daisy. Remember that your follower will have to clip from piece to piece to clean the pitch, so don't back clean them! 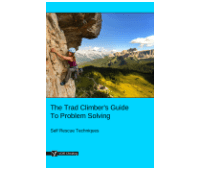 To clean a traverse or a steep overhang, you'll need to take your prusiks off the rope and clip directly into the gear that the leader placed. Effectively, you are 'leading on top rope’. Simply clip across the pieces, removing the ones behind you as you go. Make sure to re-adjust your back up knots frequently, so you won’t fall far if a piece fails. * When leading, clip as high on the piece as possible (e.g; in the plastic thumb-loop of a cam, rather than the sling). This gives you more height, meaning quicker overall progress. 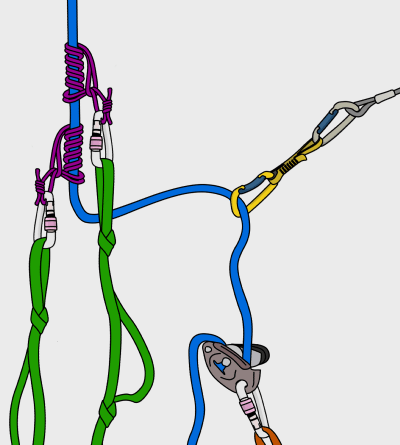 * Always use a back up (such as a clovehitch attached to your belay loop with a screwgate) when prusiking up a rope. 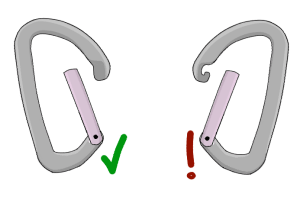 * It's better to use a 'keyhole' style carabiner for your aiders, as it will be less likely to get stuck on slings and wires than a 'nose' style carabiner. You can use either a snapgate or screwgate. * When switching from aid to free climbing in the middle of a pitch, attach a sling to your top piece. This will be your final foot step before you free climb. Make sure to clip your aiders and daisies away on the back of your harness so you won't trip over them.